As a junior entering the mining industry it is hard to think of a more difficult period to launch than in the crux of the commodity price downturn in 2012/2013. Junior explorers were being starved of exploration capital, investors were very unwilling to gamble on newcomers and the depressed price meant many projects were not economically viable from the start. Inception Mining (OTCMKTS:IMII) was fighting an uphill battle from the word go, however, with a robust company structure and a strategy for low-cost entry and operations, the Utah-based firm flourished through the mining industry’s most challenging period in the 21st century. “To our advantage or disadvantage we founded and started our operations in 2012, when gold mining markets were depressed and mining was not attracting much in the area of capital investment. It was very difficult to attract investment, it was difficult to expand, grow or do anything. The whole market was in a much more retracted, depressed state,” remembers Inception CEO Trent D’Ambrosio. The company made its first acquisition in 2013 with the U.P. & Burlington claims in Idaho, US. After advancing technical work at U.P. & Burlington, Inception made its second addition to its portfolio with the acquisition of the historic Clavo Rico mine in Honduras in 2015. “We learned to operate in a very efficient manner, very cost conscious. Striving for a low-cost production model in Honduras, we expanded and developed during that period when gold mining markets were depressed and the lacking capital investment,” D’Ambrosio continues. The Clavo Rico mine forms the base of Inception’s gold mining portfolio. The project has a history spanning 500 years dating back to original Spanish explorers mining gold and silver. Inception acquired the project as a producing mine with today’s current levels of production at a modest 550/oz per month. Although Honduras has had a mining industry for hundreds of years, it is only in recent times that it has implemented a regulatory framework that is attracting major mining projects. The small Central American nation has adopted mining laws and D’Ambrosio says Inception enjoys a cooperative and productive relationship with the regulatory bodies as well as the local community. There has been a conscious effort by Inception’s management to embed the company into the local community and this has been achieved through several outreach programs and services. “We are very much part of the community. We participate in community services, we’ve recently helped develop a trade school in the town of Corpus nearby and a children’s facility. It’s a very collaborative working relationship in Honduras,” D’Ambrosio explains. 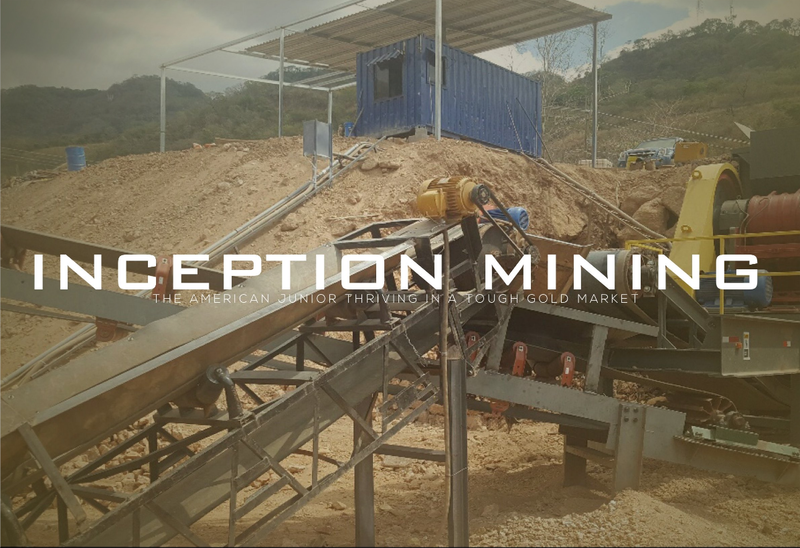 Although taking on a producing mine, D’Ambrosio made it Inception’s primary goal to homogenise production and make the whole process consistent with the target of increasing production capacity. A new crushing circuit, which dramatically increases production capability – going from 500 tonnes per day to a capacity of more than double that, has been installed. In addition, the leach pad facility is in line for expansion over the next year. With the key infrastructure in place, the company can press on with pushing up production levels. “We have done significant modelling on the surrounding area too, identifying the material necessary to produce the next 12-18 months. The company hopes to see the first results of the infrastructure upgrade in the second quarter of this year. While the advances on the infrastructure side could see important increases in production levels for surface gold, if Inception can further unlock the underground resource, then it could catapult the Clavo Rico mine to be a contributor in the gold mining industry. Drilling and additional exploration will take place in conjunction with the open-pit heap leach operation and the company hopes the underground resource will be identified over the next two to three years and then hopes to enter an underground operation. Inception’s model – based purely around manufacturing costs – means any uplifts in the gold price contribute significantly to the company’s bottom line. The efficient nature means potentially more ‘margin dollars’ and D’Ambrosio says the company is fortunate in that respect. With the Honduran project not wedded to the gold price index thanks to efficient production schedule, Inception has leveraged its other asset, U.P. & Burlington, against the fluctuations of what can be a volatile price market. “U.P. & Burlington is a fully outsourced model so we can operate it when we see fit. We employee contract mining, contract milling and contract hauling so we are not subject to operating when gold prices don’t allow us to. We don’t have large capital infrastructure need, we do not have employees at the UP & Burlington site, and very limited equipment of our own so it makes us very agile in that respect,” remarks D’Ambrosio. The mine is another historically producing asset, with significant production back in the 1800s and 1900s. Since acquiring the property, Inception has invested heavily in building a heavy haul road, mapping the material body and running a bulk sampling programme. The mine site is now accessible and in the next steps readying for production. The United States has a mature regulatory framework that, when combined with the low start-up costs of the contract mining model, means a relatively simplified entry to production for Inception. Furthermore, D’Ambrosio indicates the friendly regulatory atmosphere has reignited an appetite from the investor market and current economic uncertainty has resulted in gold being viewed as a ‘safe haven’ asset. “We are very excited for what the future holds for us. We believe we have a significant resource that has been tapped but remains relatively untapped considering today’s new technology and mining techniques. Metals markets are gaining strength the investment community is shining a more positive light towards the industry. We are position well and look forward to a promising future!” D’Ambrosio concludes. On balance, Inception is in a very strong position, with efficient production and a quick and easy entry to second-project production, to prosper with the gold price potentially returning to former strengths.